Riley enthusiasts will remember the wonderful rally of 1996. Held at Coventry’s Coombe Abbey, it was organised by the very new Association of Riley Clubs to celebrate the centenary of the founding of the Riley Cycle Company. 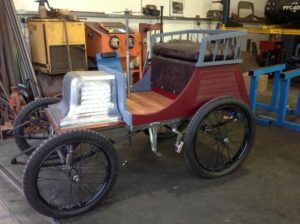 The year1896 also saw Percy Riley leaving school to join the family business and to start in earnest to design and build the Voiturette which became to be known as ‘the first Riley’. The ARC, no doubt keyed up by the huge success of the rally, decided to embark on a second eye catching effort, namely to commission the building of a copy of Percy’s car. This would be no mean feat considering the almost complete lack of information. The car had disappeared sometime in the early years of the 20th century, nothing of Percy’s notes or sketches existed and only two photographs of the car had survived. These of course are very well known having been featured in various histories of the company and in articles in Riley club magazines. Study of these photographs show the car to be neglected and in poor condition. There appears to be evidence of a number plate at the front which, since these did not become law until January 1904, suggests that the vehicle was at least some six years old at the time of these images, consistent with its apparent condition. We know from family records that Percy finished the car in 1898 and an article in the ‘Autocar’ of November 1900 tells us that much testing and improving had been carried out throughout the previous twelve months, reflecting Percy’s known characteristic of striving for perfection. 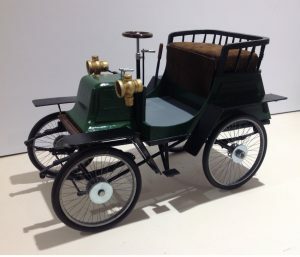 Percy himself had gone on to other important work by 1904 and another known characteristic, that of only concentrating on one project at a time, would have ensured that the Voiturette no longer held his attention. So ARC was faced with promoting a project that relied entirely for information on two ancient photographs of tantalisingly indistinct detail and no period accounts. Furthermore, the original photographs had been enhanced for publicity purposes when the company saw the value in promoting the ‘as old as the industry’ slogan and some of the highlighting now distorts or hides what could be very useful information. Nevertheless ARC embarked on the project and with much enthusiasm and effort by Victor Riley and Chairman, Jim Fletcher, enlisted the support of BMW and Manchester University, the one providing financial help and the other research and technical backup. Unfortunately political forces brought about changes that ended the project and no useful additional information about the car materialised at that time. 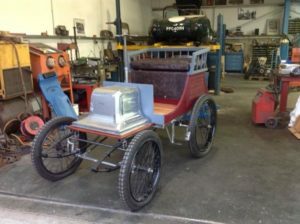 The project was not completely abandoned however and over the next few years views, suggestions and comments were sought from veteran car enthusiasts and in 2004 ARC decided to make a second effort to build the car. A lot of good work was done by Alan Dixon, an experienced technical illustrator who scaled the main dimensions from the two photographs and produced general arrangement drawings which were to prove extremely helpful subsequently. Rod Sterland of the RM Club also did much work on identifying some of the unknowns of chassis and body construction which were to guide our subsequent thinking. However, once again the fates conspired against the project. Other pressing demands on volunteers’ time prevented further research and fund raising and so once again the project was abandoned. In 2014 an opportunity arose to rescue an ailing Riley based charity and agreement was reached between the ARC and the three Riley clubs to take over, renaming the charity the ‘Riley Cars Heritage Trust’. 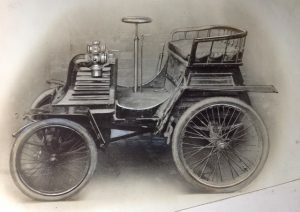 The trust’s original deed of covenant refers to the preservation of all things Riley and while trustees and clubs were still searching for a new beneficial role, it was agreed to take over the 1898 voiturette project from the ARC and make a new start. Without doubt this is a daunting project as so little can be deduced from the two photographs but by taking Alan’s earlier work to another level we have been able to produce working drawings for the basic chassis, axles, wheels etc, and for all body sections. To test the scale and perspective we also produced a one eighth scale model and there is general satisfaction that we have got it about right. The model on the left and original side view photograph on the right. Where we have considerable difficulty is in the transmission details and leaving aside the engine, which has a different kind of problem, we need to make some decisions, based on a consensus of expert opinion, on which way to go. This expert opinion on what could have influenced the young Percy and what was favoured practice at the time is being sought from historians, motoring journals and veteran owners and enthusiasts near and far. The engine is intriguing. We know that Percy was very keen on proving the efficiency of the mechanically operated inlet valve and this was probably central to his ideas of building his motor car. The engine he put into his car has not been recognised by any knowledgable person so far approached! Suggestions abound but we are now fairly certain that it is a hybrid, perhaps using a crankcase from a small industrial engine, and fitted with a cylinder head cast locally to Percy’s own design. If this is the case it will be difficult, but not impossible, to replicate it and if we want to motor it, we may have to settle, initially at least, for a period engine of similar size and type. For the purposes of display and encouraging youngsters (of all ages!) at public events it will be good to make the car drivable but another option is to put it on static display with a false engine modelled to look more like Percy’s original. The first items to be tackled were the building of four special spoked wheels and having them fitted with beaded edge tyres. Following on from this we had a complete set of leaf springs made, full elliptical for the front axle and half elliptical for the rear. All of this work had to come from specialist builders and was very expensive making a big hole in our limited budget. Once these items had been received work was started on the chassis and the front axle. 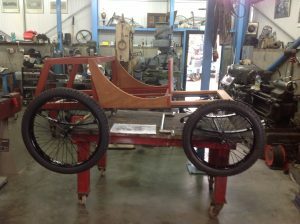 At the same time work began on the body frames and panels. It has been necessary to work tentatively in all areas as much experimentation had to be carried out, particularly with such details as the steering geometry. 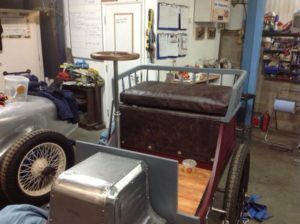 Progress has thus been slow but nevertheless has been steady and on the occasion of a visit from the South Bucks Register members in October this year we were able to put some of the components together to give an idea of how the car is beginning to take shape. It is hoped that most of the chassis work and the body will be complete by the end of this year and that good progress towards a successful end result will be achieved in 2018. If you feel that you can contribute in any way at all whether it be practical, intellectual, financial or simply encouragement do please contact me through your club chairman or on the email address below. We still need a lot of help and any assistance will be most gratefully received. Chairman, The Riley Cars Heritage Trust.